So I mentioned early last week that we were headed to the beach for a few days (and thankfully, the tropics were quiet this time around). Well, for those who don't know, many who read Phil Vischer's blog on a regular basis have begun praying every Tuesday for the JellyTelly Christian Media Network that's launching this fall. So, when I saw a jellyfish on the beach Monday afternoon, it reminded me of our upcoming prayer day. We usually see one jellyfish each day we're there, so I prayed a bit right then and resolved, "Every time I see that jellyfish tomorrow, I'll remember to pray for JellyTelly." When tomorrow morning came and we walked to the beach again, we saw two jellyfish washed up near our favorite spot. So, Papa and I talked about JellyTelly. I wasn't near a computer to grab the recent list, so I just prayed for whatever came to mind. We went back to our "clubhouse" as my youngest one called it, had a late lunch, played games, roasted marshmallows, gift-shopped a little, and found a few other things to entertain the younglings and kill time during the most sun-blistering time of the day. After an early dinner, we headed back over to the beach to play until twilight. Passing by the two jellyfish, I prayed again for JellyTelly, and then went to play and hunt for shells. 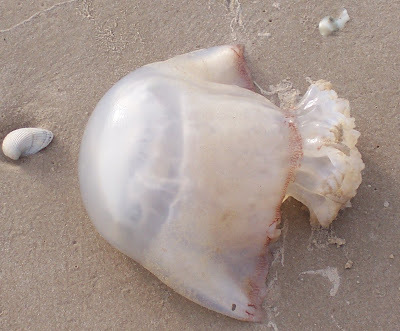 But I'm guessing God wanted me to pray some more, because another jellyfish washed up while we were there. The pastor dude picked it up by its top and threw it up towards the sand dunes, so that no one would accidentally step on it and endure the excruciating sting. When another jellyfish washed up to shore, I was at a bit of a loss for words. I'd already pretty much prayed for everything I could think of in regards to JellyTelly. So... I just concentrated on thanking God for what He's bringing about through Phil and others, and sharing my excitement with Him about the idea. If you've read my Kissing The Prayer List Bye Bye blog entry, you'll know a bit where I'm coming from when I say I'm working to develop a closer relationship with God, and sometimes that just involves sharing a joyful moment together. And then another jellyfish washed up! Yes, another one. We usually see one jellyfish a day; and on Tuesday, we saw five. As I watched the pastor dude toss the jelly, something he was quickly becoming a pro at, I wondered what in the world else I should pray. I didn't want to be redundant in my communication with God, so I asked Him about it and waited. As I was quiet, here's what came to mind: The issue between Phil and God aside, it was a lawsuit, though later overturned, that dealt the deadly blow to Big Idea Productions. So... I spent several minutes that evening asking God to protect JellyTelly from frivolous lawsuits and any kind of issue regarding intellectual property, copyright, etc. -- anything that could sink the boat before it ever launched. After that, God gave me peace. I don't know if I'll ever know the reason why He kept prompting me to pray. That's the cool thing about God -- you can't see all the things He prevented from occurring; because, well, ummm.... you can't see something NOT happen, now can you? 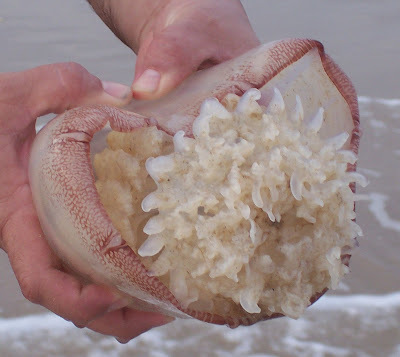 Sure, you could say the jelly thing was just a coincidence; but in my opinion, it was all God in the way I was instantly reminded to pray each time I saw one. It's a blessing to be a part of JellyTelly with my prayers, especially since I have zero talent in animating, puppetry, video production, etc. We can all help launch a network with no special skills at all, just our humble prayers to God. That's exciting!